Rank #1 on Youtube using these secret tips! Um..not quite, and as I dug further into the world of video SEO, I was falsely promised thousands of views, top rankings and lots of subscribers. 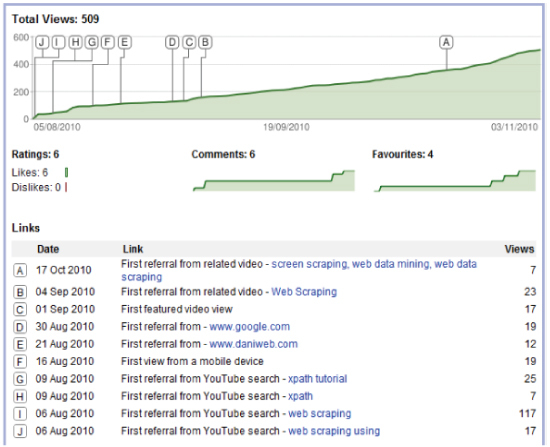 So, I decided to have a crack – or find out as much of the truth about Youtube SEO as I possibly could. Not in the interest of spamming Youtube with crap videos, but to legitimately rank well for a useful video. Forward: Please keep in mind this was a basic experiment conducted in an attempt to understand the Youtube Ranking Algorithm. 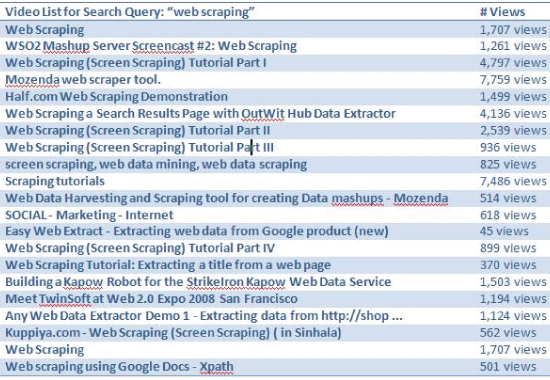 I will expose all of my actions that saw my video climb up the ranks to number 2 for my targeted keyword, “web scraping”. 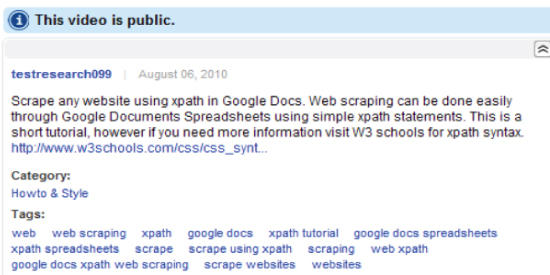 About the video: Using Google Docs spreadsheets, a bit of xpath, and a sprinkle of genius fairy dust from Tom, I was able to gather data from the web quickly and easily. So I made a video tutorial to teach others. The competing category: Can’t say how competitive it was because the Youtube Keyword tool didn’t have enough data. The competing videos had view ranges from 45 to 7,000+, and some users had 20+ videos and very active accounts. See table below. Ok, so that featured video highlighted box does rotate. It rotates videos from promoted to other videos in the category. I still don’t know why, or what influences it. Search history? Cookies? Genuine community interest in that video? Totally random? I’m ranked number 2! Co-incidence? Haven’t done much since October 4th, except being logged in while I’m watching other videos. Ranks haven’t changed, and I’m stable in Google and Youtube rankings. 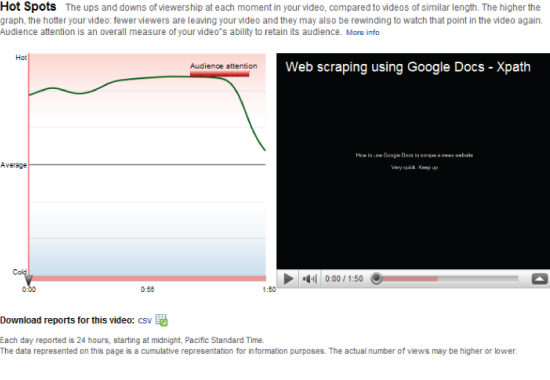 Youtube thinks I've done a good job with the video, as indicated by audience attention. If you want to know more about hotspots and how I used to it make an interesting video, read my post on Youtube Insight. If you’re putting a link in the description, use http:// before the URL or it won’t work! Use the description to actually describe the video, you could write a short story in this box but I suggest to not overdo it. Don’t stuff it full of popular keywords or irrelevant information. Don’t try and trick Google, it ruins the Youtube experience and they are extremely smart. Tag the video with appropriate tags, and again don’t stuff it! If you have more than one video, use annotations to guide your viewers through to the next video, to your channel, video response and much more. Don’t use someone else’s material, especially music. You’ll get a penalty, trust me. Youtube has a collection of audio tracks you are free to use, again Youtube will penalize you for using copyright material. Input at least one call to action: a link to your website, annotation etc... Give the viewer the opportunity to see more content. Youtube allows approximately 22 words for the description on the query page (see below). Try to associate your keywords early and describe as much of the video in the first 22 words. Youtube and viewers see this. Find users in your target market and be friends with them. Become a master of Youtube Insight. Demographics, discovery and much more data that will help you create your next video. Make a video transcript (closed caption file). It helps with indexing, allows deaf users to read through your video and provides language support. Youtube API, Youtube RSS Feeds. ‘nuff said, check it out. Competitor research. Check the backlinks, and see what you’re up against. Adding video times (ex. 00:13) in the description box will automatically become a hyperlink to specific points in the video. Use it to create a mini video map, additional to the video transcript. Annotations have the ability to become outbound links. So in-video calls to action can link outside of Youtube. As of now, I believe only non profits can do this – please correct me if I’m wrong. If you would like to contribute to my experiment, have recommendations, or have additional questions to subjects I haven't covered here - I encourage you to leave comments. Thanks for reading and happy You-tubeing!